The Galaxy Note 9 has already been spotted on benchmarking website Geekbench a couple of times. The SM-N960U was the first model to appear online, it’s the Snapdragon 845-powered version meant for the United States. The SM-N960N destined for South Korea followed a few weeks later and it was the first time we saw the device being benchmarked with the Exynos 9810 chip. The unlocked Galaxy Note 9 has surfaced on Geekbench today. Like all international unlocked variants, the SM-N960F is powered by Samsung’s Exynos chip. The score is a bit different this time around, though. The Exynos 9810-powered Galaxy Note 9 model number SM-N960N posted a single-core and multi-core score of 2737 and 9064 respectively. 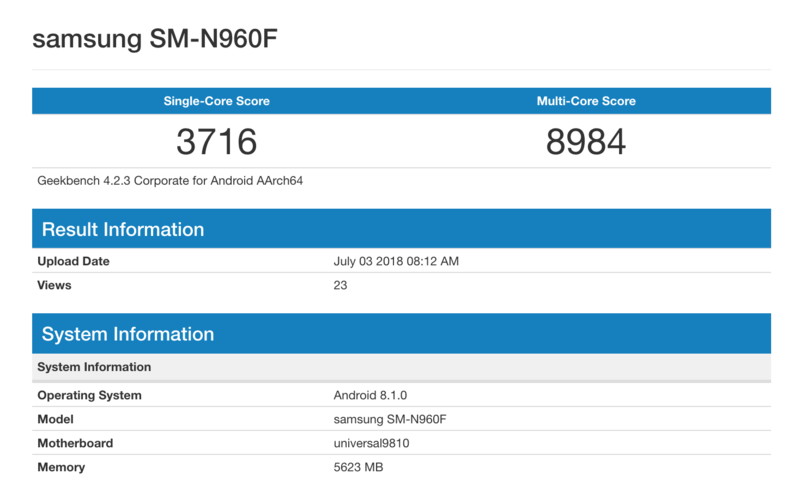 The unlocked Galaxy Note 9 model number SM-N960F with the same chip has posted a single-core and multi-core score of 3716 and 8984 respectively. We noted back then that while the multi-core performance was similar to what one gets with the Galaxy S9+, the single-core performance was notably lower because Samsung likely wasn’t done optimizing the software. Today’s benchmark listing of the unlocked Galaxy Note 9 shows that Samsung has clearly made improvements in this regard. The listing also reiterates that the Galaxy Note 9 will be powered by Android 8.1 Oreo at launch and that it will have 6GB of RAM. That being said, benchmark results never show the full picture when it comes to actual performance so it’s better to have the device in your hands before forming an opinion about the performance it provides. The numbers do look promising, nonetheless. Samsung has confirmed that it’s going to unveil the Galaxy Note 9 at an event in New York on August 9. It’s also where the company will reveal how much this device is going to cost and when it will be available for purchase. Do check out our detailed coverage on all Galaxy Note 9 specs and features to get an idea of what to expect from Samsung’s upcoming flagship. Wow so Oreo 8.1 is Note 9 exclusive. Let’s wait and see how people react to their S9 series not being updated in the next few months. err the S-Pen? You know, the fundamental differentiator of the note series? The thing that makes it pretty unique in the current marketplace? I haven’t seen a hardware review on sammobile, jus rumours.